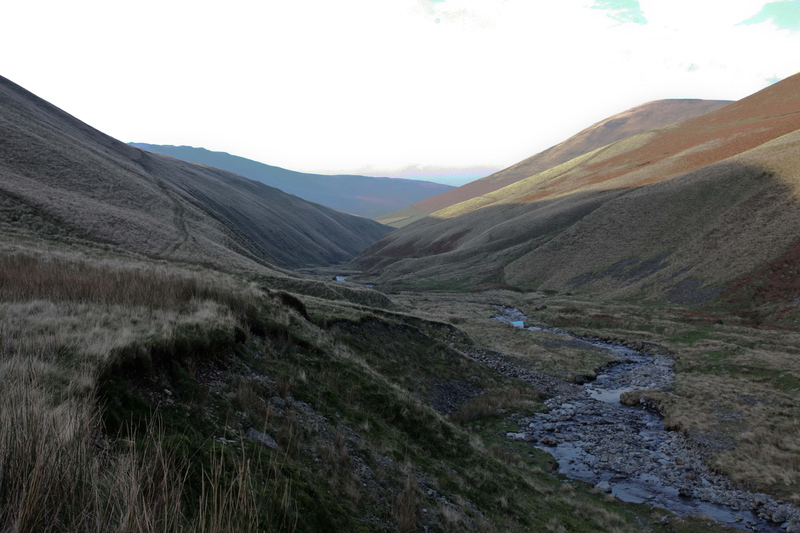 Between the Lake District and the Yorkshire Dales lie the Howgills. These hills are a mixture of contradictions. They are quiet, lonely hills, yet several thousand motorists drive by them each day. 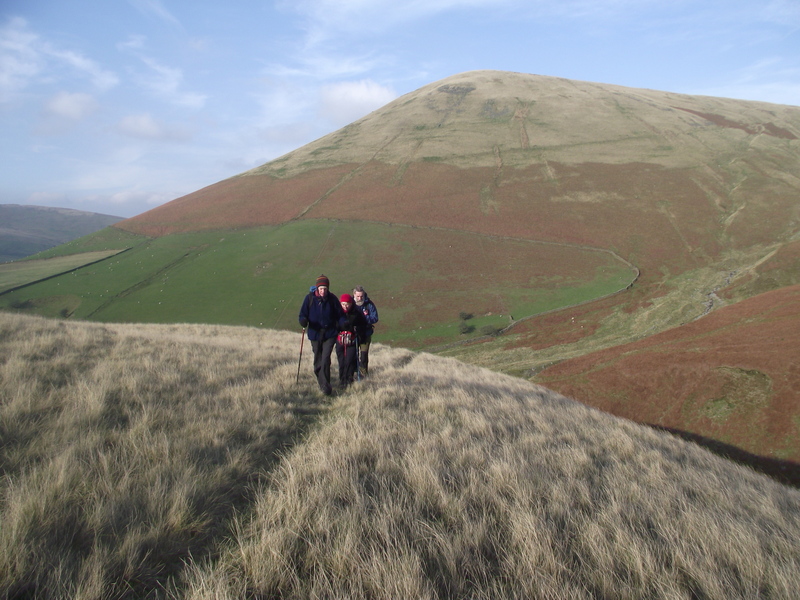 They are small hills, with the highest top at a mere 676 metres, but to walk across them without huge height gain and loss is almost impossible. 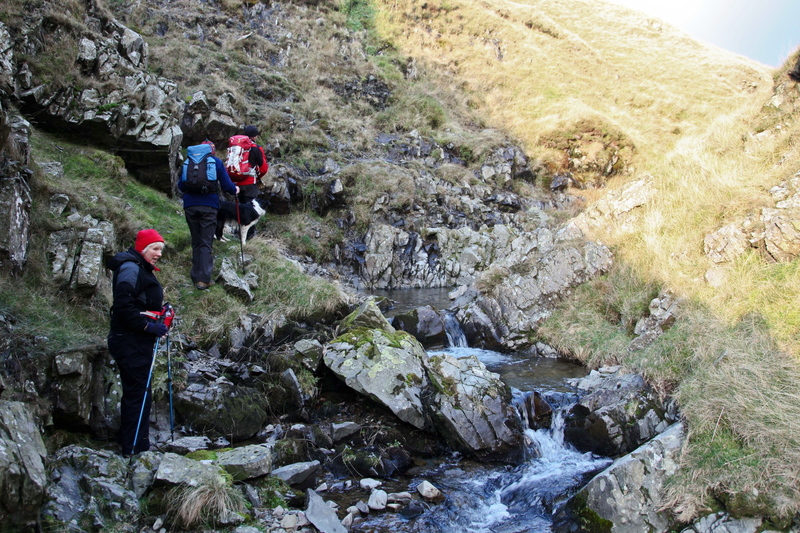 They are in the County of Cumbria, but half of the range lies in the Yorkshire Dales national Park. 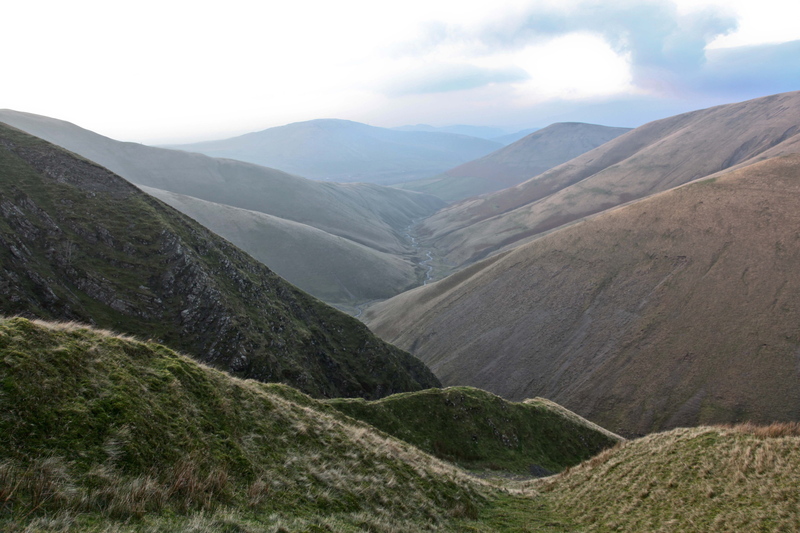 They are unique – they are the Howgills. It had been the monthly music session at John and Miv’s local pub, so Chris and I (and t’dog) invited ourselves over for the night, to be followed the next day by a walk somewhere nearby. 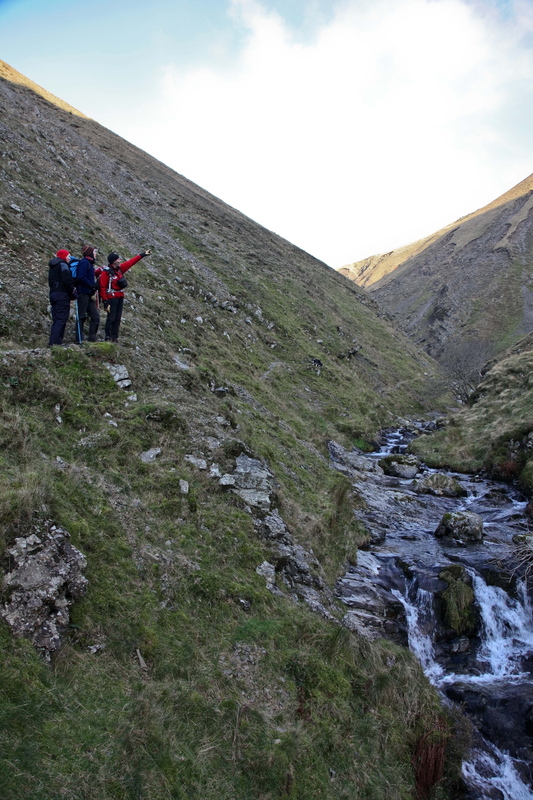 Carlin Gill in the Howgills seemed to tick most of the boxes, so after a late start the assembled team set out up the quiet, deserted valley. The M6 Motorway is a mere kilometre away, but the thousands driving along are oblivious of this quiet place. 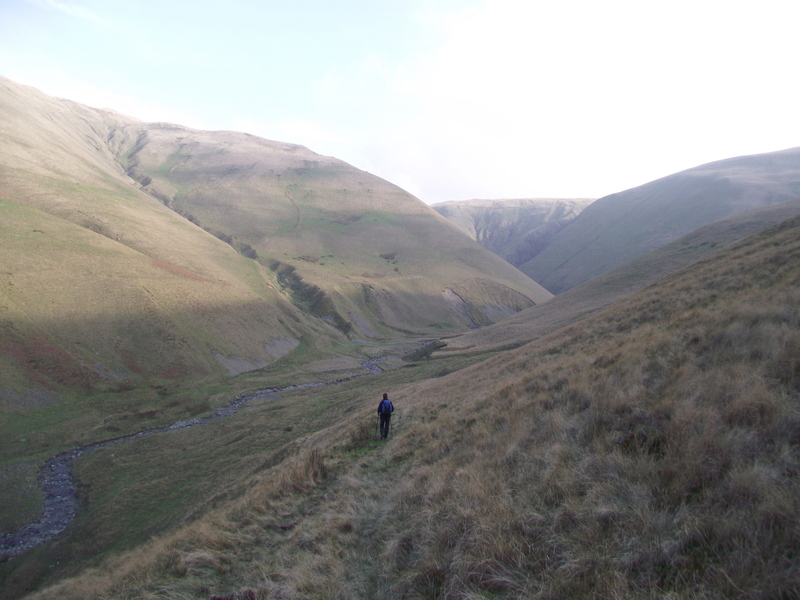 The landscape is typical Howgills, with steep valley sides, and as the valley changed direction things began to get more interesting. 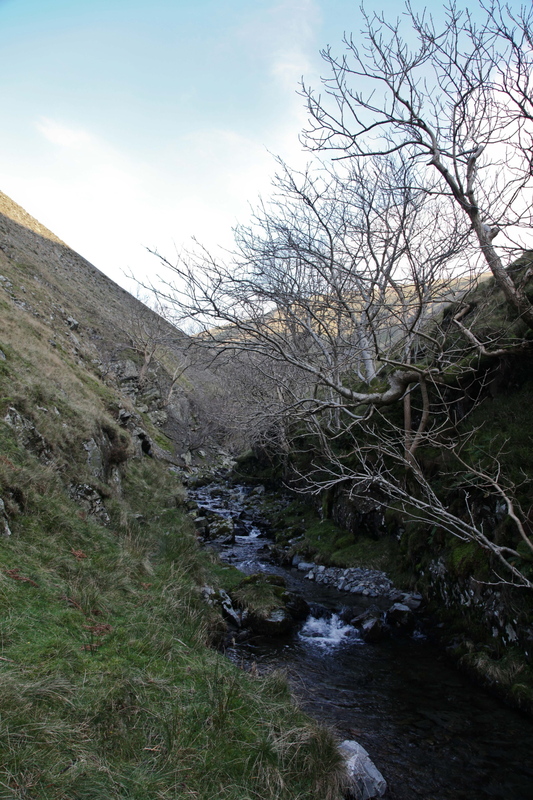 Carlin Gill suddenly narrows and turns beyond the junction with Small Gill, and the easiest way forward is a narrow path clinging to the hillside above the stream. Beyond there the path rejoins the stream, but not with the wide valley as before. 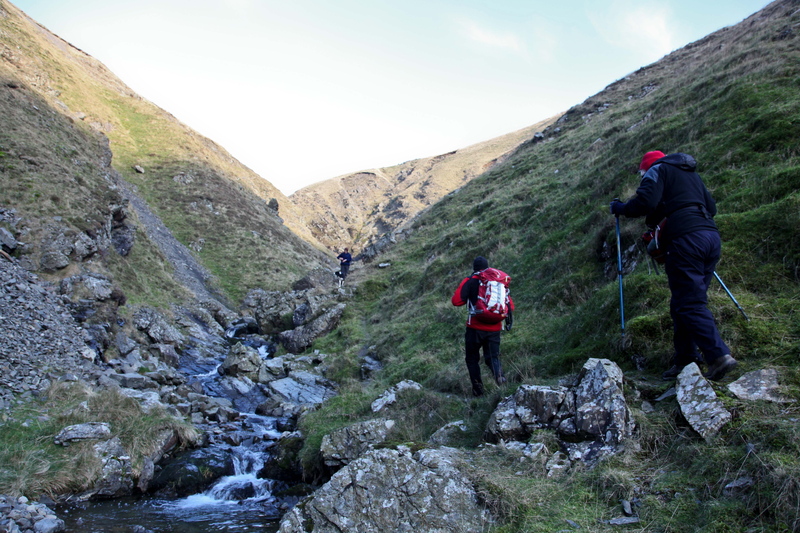 Instead, the stream is confined by the steep valley sides, as is the path which twists and turns as it steadily gains height. Then, suddenly and unexpectedly, an impressive cleft opens up on the right – Black Force. Despite having a forbidding appearance, Black Force is a mere Grade 1 scramble, where the main difficulties can be avoided. It is also known to give a decent ice route when really cold, and both John and I were making mental notes for the coming winter. 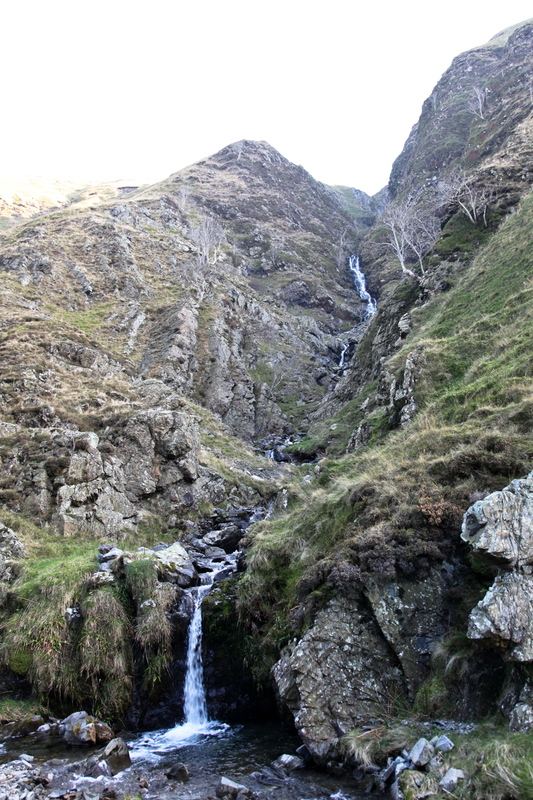 Black Force wasn’t on the menu today, however, so we pressed on up the valley to where, once again, it narrowed before coming to an un-climbable obstacle – The Spout. 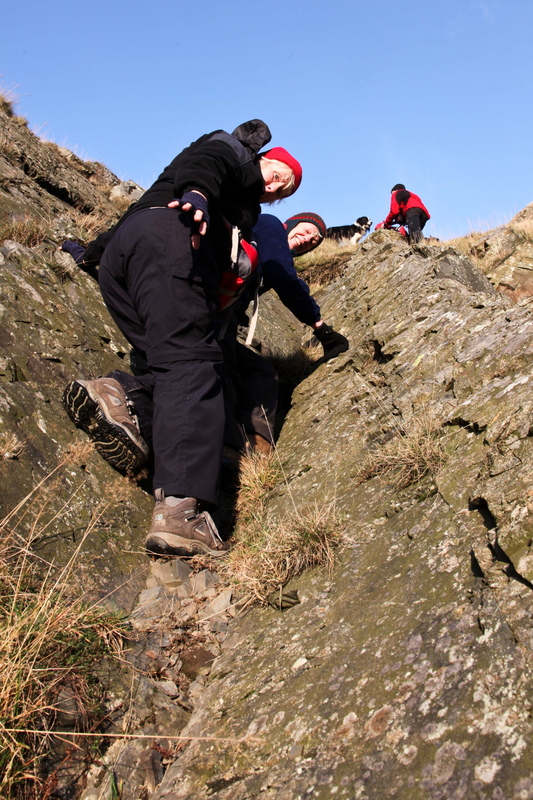 Un-climbable obstacles usually have a way round them, as was the case here – a short rock slab gives access to a steep grass rib with a well worn line taken by others. 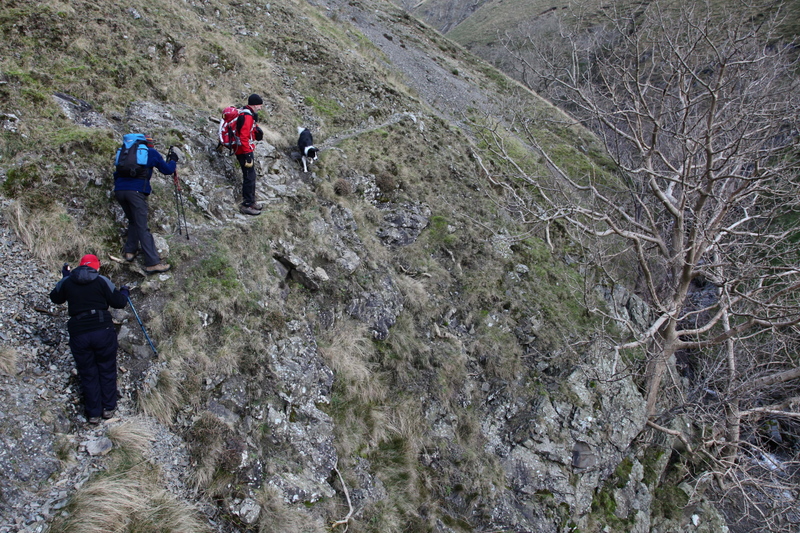 Miv and Chris accepted some moral (and practical) support getting up this bit, and even Border Collie ‘Mist’ seemed glad to have a push up the backside on the steep bit. Meanwhile, John and I debated yet again the ice climbing potential in a freeze. Beyond The Spout the stream puts in a few more twists and turns before the valley opens out. 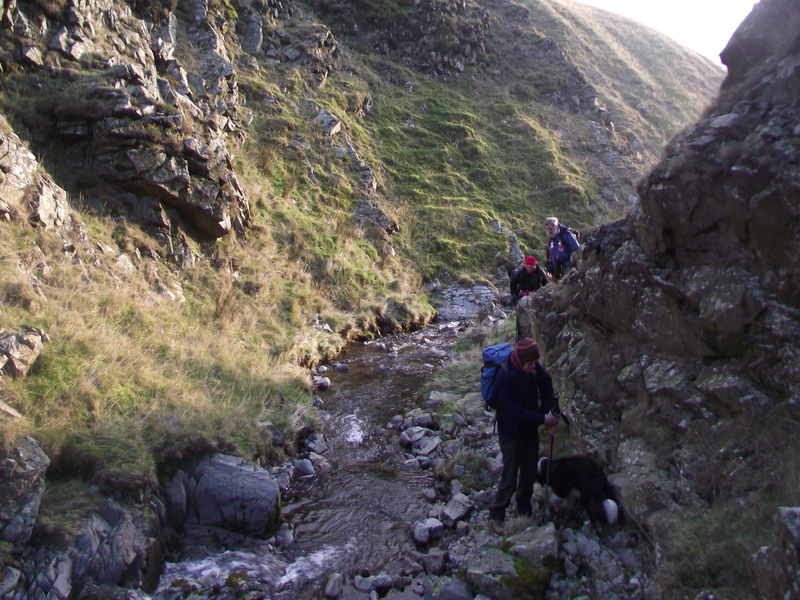 Our late start suggested a direct(ish) return, so we took the path above Force Brow heading for the top of Black Force. 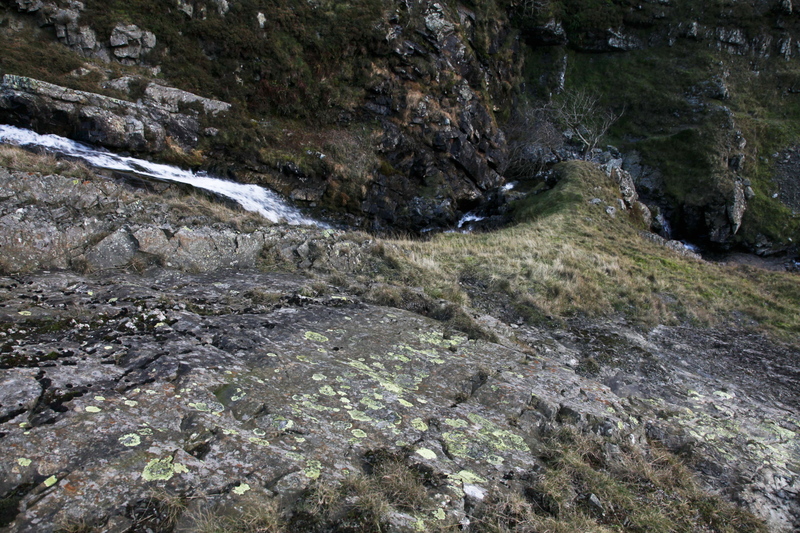 From here a good path sweeps along like a terrace, before finally starting to lose height above Fairmile Beck. 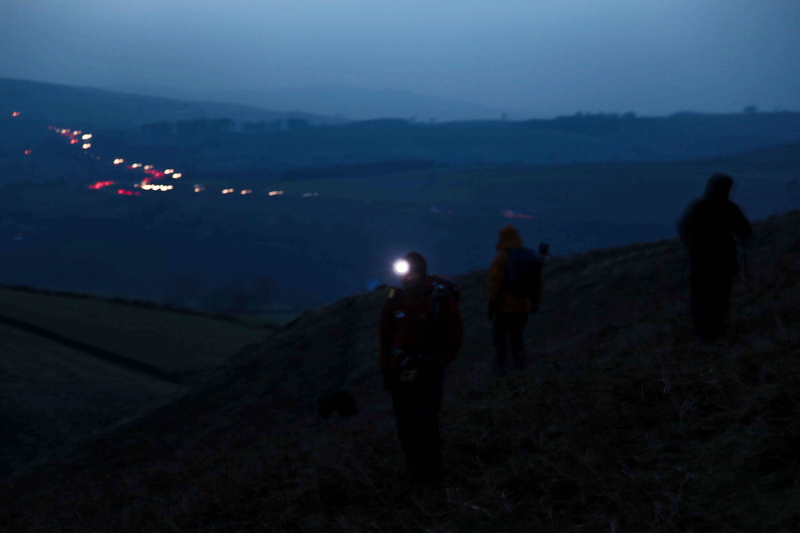 The descent of the broad grassy slope between Blind Gill and Fairmile Beck wasn’t made any easier by the failing light, and we used headtorches for the last section down to the road. Our late start resulted in a late finish, which suited me as I love a night finish to a walk – Miv and Chris seemed less impressed (and let me know about it!) 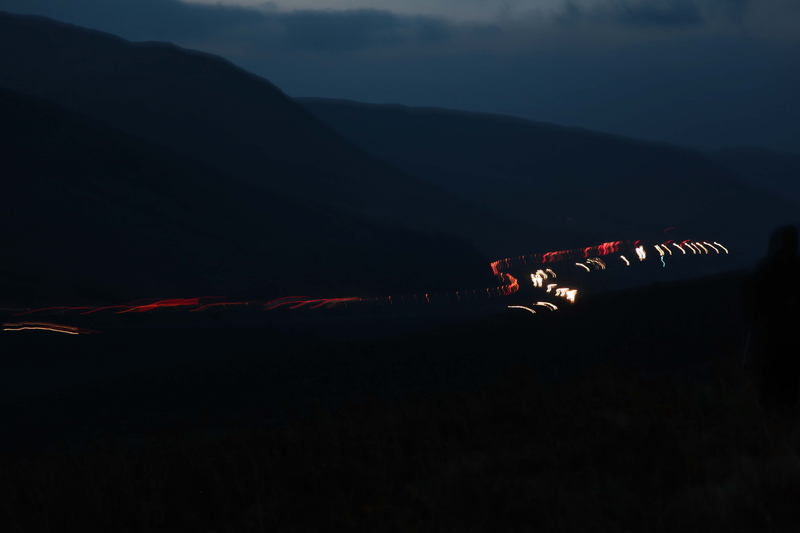 but ‘Mist’ carried on with the business of herding the humans off the hill, while John had a great time trying ‘arty’ photographs of cars on the nearby M6, their lights painting streaks of white and red in the images. Half an hour later, we were amongst those car lights – unfortunately they weren’t moving fast enough to produce the light effects. 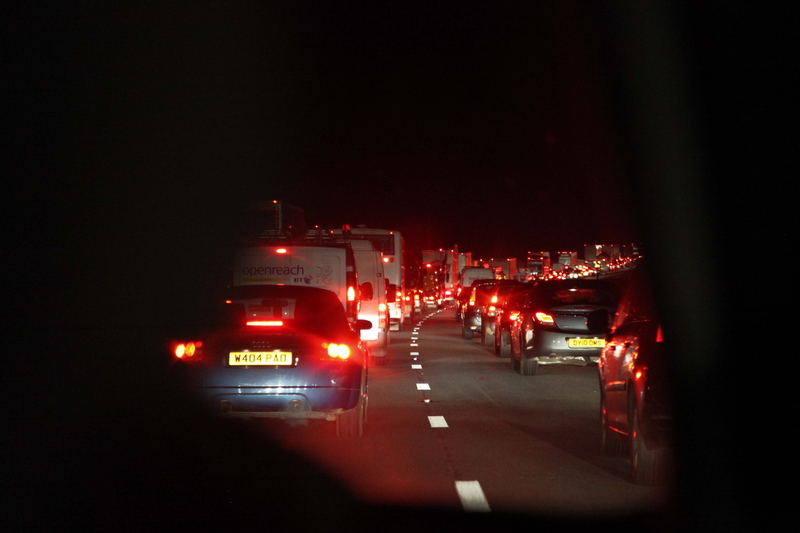 In fact, they weren’t moving at all – a ten-car accident left us sitting it out for an hour until the road was cleared. Still it gave us time to reflect on a great day out. p.s. 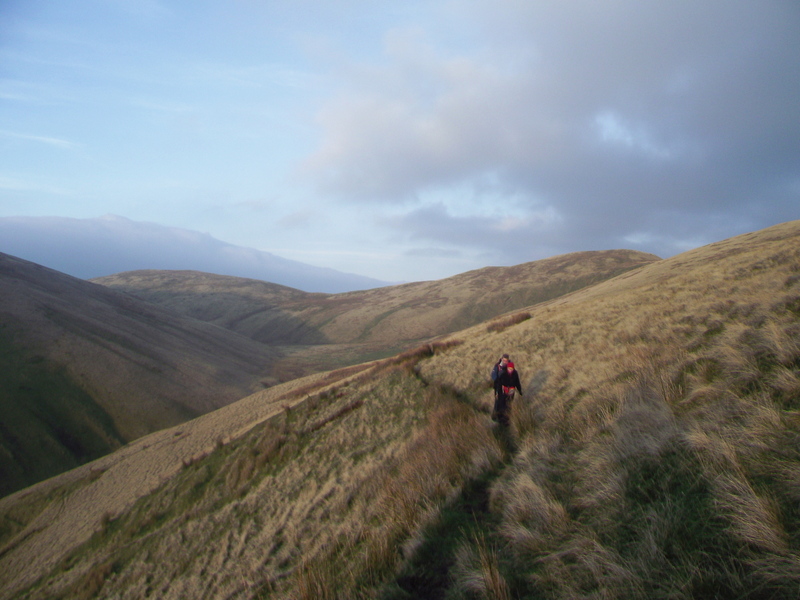 Non-UK readers may not recognise some of the words used to describe hill features – they are words in current usage in the North of England, and are derived from old Norse words, brought in by Viking settlers over 1000 years ago. 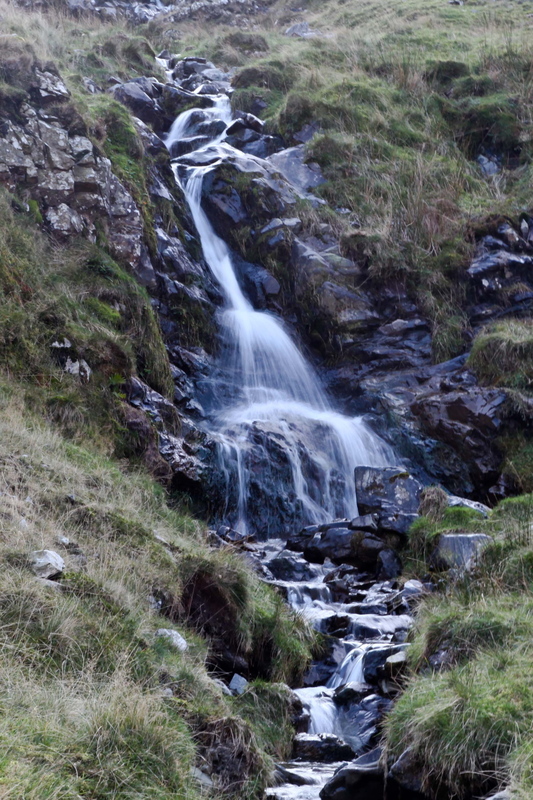 So, a gill (gjel) is a ravine, a force or foss (fors) is a waterfall, a fell (fjall) is a hill or mountain and a beck (bekkr) is a stream. p.p.s. The blog is now exactly one year old, and at the time of posting is due to pass the ‘4000 hits’ mark! Thanks to all of you for dropping in and reading, and please keep on doing so, otherwise it gets very lonely here. As usual, if you have enjoyed reading please share on Facebook, Tweet on Twitter or subscribe for email updates – posted every week, first thing Monday morning. This entry was posted in 4. 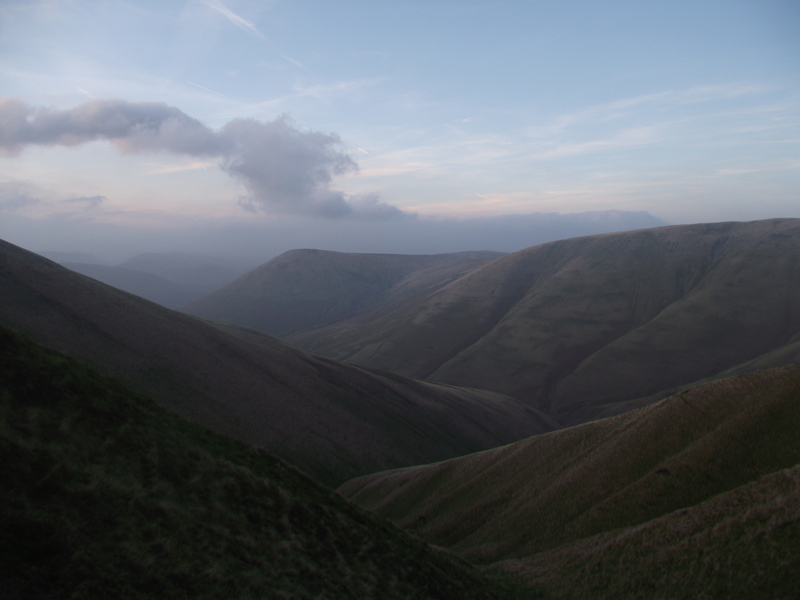 Northern England and tagged Cumbria, hillwalking, Howgills, photography. Bookmark the permalink. 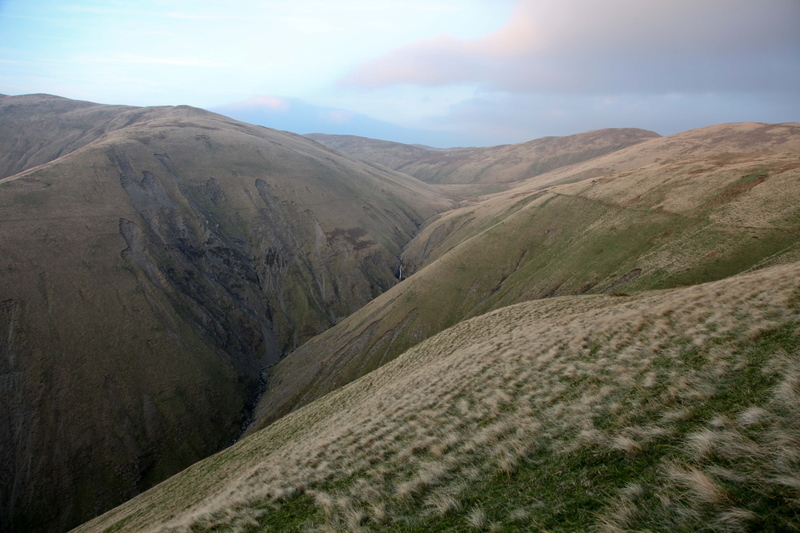 8 Responses to #53 – Carlin Gill in the Howgills. congrats on your blog’s birthday – where’s me bit of cake then? Haha…. where’s me birthday drink then? 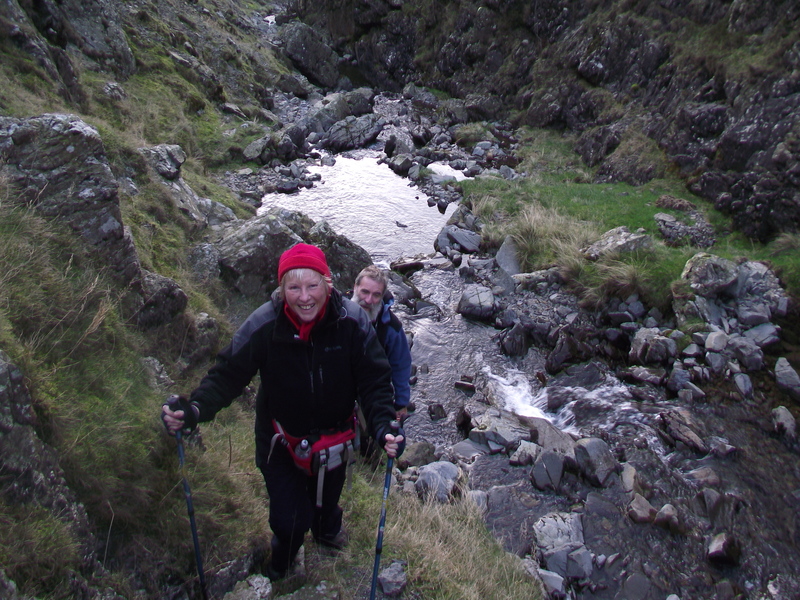 You could have a very pleasant solo trip as far as The Spout, without any real difficulty – I’m fairly sure of that ‘cos the decibel level from Miv and Chris wasn’t too high – they have ways of letting me know when it’s getting serious! 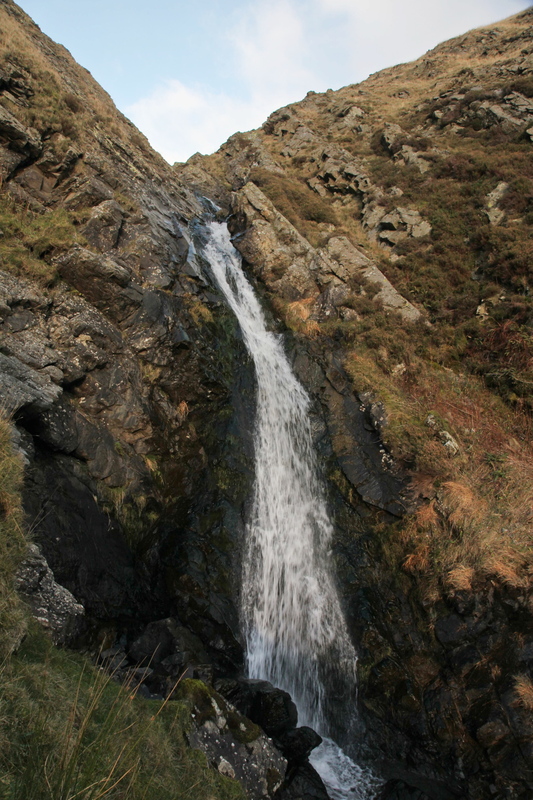 At The Spout, there’s no need to take the slab option – it’s easier if you go almost to the foot of the waterfall, then take the steep bank going leftwards, and it gets you onto the grass rib heading upwards. If you didn’t like any of that, it would make a great afternoon just wandering about. I can almost guarantee that you wouldn’t see a soul. Loved your photos and descriptions. Thank you.